This relaxing body service is soothing to the stressed out soul. Body, hands, feet, and scalp are all lightly effleurage, restoring harmony to your life. This is a gentle session with no pressure or working on “knots” – just soothing quiet time to relax. One night stay in standard room Sunday- Wednesday. $139.00 plus tax, 45 minute stress relief massage for one, Complimentary breakfast and 20% off the restaurant, beverage not included. Cozy up together at D. Hotel Suites & Spa for a romantic one-night stay. Enjoy a bottle of bubbly, chocolate-covered strawberries, and a one-hour couple’s massage at D. Hotel & Spa. 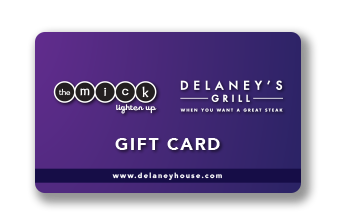 This romantic package includes $75 toward dinner at Delaney’s Grill or The Mick, complimentary champagne and chocolate-covered strawberries in your room and a full breakfast in the morning. All for one low price. 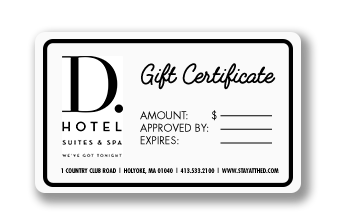 Spend the night at D. Hotel Suites & Spa and take advantage of our romantic couples’ package, including a $25 credit at the D. Hotel Spa, $75 toward dinner at Delaney’s Grill or The Mick, complimentary champagne and chocolate-covered strawberries in your room and a full breakfast in the morning. Ideal for business travelers, this weekday package entitles you to any single food item on The Mick menu, our casual dining pub, and a full breakfast in the morning. Starting at $109. Available Sunday–Thursday. Experience great lodging and dining in the Pioneer Valley. Spend Saturday night at D. Hotel Suites & Spa and take advantage of our romantic couple’s package, including brunch for two, complimentary sparkling wine and chocolate-covered strawberries in your room.